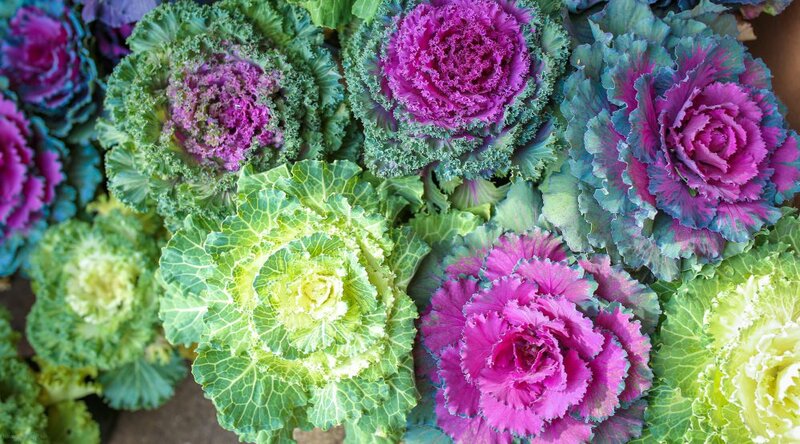 These ornamental brassicas add color to your fall garden. Ornamental cabbage and kale are easy ways to bring color to your garden in fall and winter – usually until the first heavy snow of the season covers them up. The ornamental brassicas, like their cousins – the brassicas you grow in the vegetable garden to eat – are annuals, but they are worth the trouble of planting each fall for the bright colors they provide. The flowering brassicas were bred by hybridizers simply to look good, emphasizing their ruffled foliage in red, purple, yellow and other bright colors. These plants will not grow much after you plant them, so if you want a large, striking plant, spend the extra money for the larger specimens. They don’t tolerate heat well, so don’t plant them until late September or early October, when night-time temperatures will be 50 degrees or below. They will survive temperatures as low as 5 degrees as long as they don’t suffer a sudden drop in temperature. Mild frosts will intensify the colors. Ornamental cabbage and kale can be planted from seed outdoors, but you’re too late for that this year. Next year, plant the seeds sometime between mid-July and early August. Do so in rows about 18 inches apart, with six inches between the seeds. Don’t cover the kale seeds, because they need light to germinate. The seeds should sprout in a week or two, and when the plants are 3 inches tall you can thin out the weakest-looking ones, and leave them about 18 inches apart.